With the start of the new academic year, we can all work to make learning safer for students. Whether you have a child going to school, or drive by a school zone on your way to work, here are some ways you can help make the roads safer. (NC) Did you know that parents are seeing an increase in unsafe driving practices in school zones over the last few years? A recent survey by CAA shows behaviour from parents and motorists that causes concern, like distracted driving and speeding. Slow down. 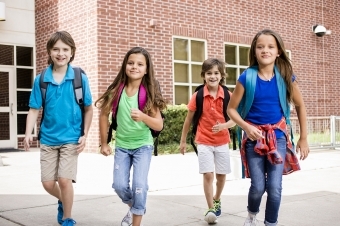 Giving yourself more time at pick up and drop off, and following school rules for these procedures are the top things parents can do to increase safety. Leave a bit earlier to give yourself plenty of travel time to avoid rushing and making dangerous moves just to get to school before the bell rings. Remember to slow down when driving through school zones and watch for children trying to cross. Get organized. Many of us end up speeding because we're late to get to where we're going. While leaving early is a great way to curb this, you can also give yourself more time by doing some of the morning chores the night before such as: picking out your kids' outfits, packing lunches for everyone and making sure any last-minute items like umbrellas or jackets are easily on-hand at the door. These suggestions can help make your morning smoother. Listen to safety helpers. The CAA School Safety Patrol is made up of thousands of student volunteers in various communities across the country who help their peers get to school safely. All safety patrollers wear bright vests designed with safety and visibility in mind. Follow speed limits. School zone speed limits can vary by location and time of year, so drivers should learn the rules for their community to help keep the roads safe. Schools and community centres are hubs of activity where kids are out playing even after school, during summer vacation and other school breaks, and on the weekends. Avoid dangerous and illegal driving. Anything that takes your focus away from the road counts as distracted driving. Texting is especially risky, as drivers who text are 23 times more likely to be in a crash or near-collision event. While driving, do not text, use apps or read emails. Avoid eating and drinking when you're behind the wheel.